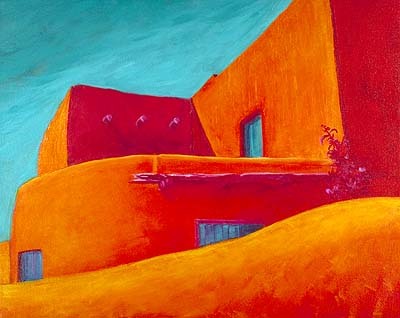 The colors and shapes of adobe buildings in New Mexico fascinate me. When I'm home in Ohio I like to exaggerate these aspects and use them as abstract design elements in a painting. I isolated this part of the building in my photograph, sketched the lines on canvas and underpainted the entire canvas with a red-orange background. Then I painted the sky, windows and doors and finished with details and color accents. A step-by-step demonstration of this painting is in Exploring Color, pp. 104-105.